This is a guest post written by Hannah Gillow Kloster. 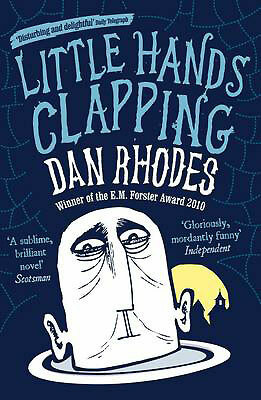 Dan Rhodes’ latest novel, Little Hands Clapping, was published amid great expectations in 2010,following successes such as Little White Car, Timoleon Vieta Come Home and Gold, perhaps my personal favourite. I have had the good fortune to have met Dan a few times, and he is one of those writers who, when you meet him, you think “of course he has written those books! Of course he writes like that!”. Like his books, he is funny, in a deadpan and ever so slightly uncanny way. So as I picked up my hardback copy of Little Hands Clapping from the Trafalgar Square Waterstone’s I was tutting loudly over it being hidden in a shelf under R only a few days after it’s release – Dan Rhodes is an author who gets way too little attention. (I believe I even said so to the boy working in the shop. Poor guy. He couldn’t do anything about it. But I like to think it made him feel important). Anyway, I bought the book, and got on the train home, and started reading. And within pages another magical Dan Rhodes universe was unfolding – one of fantastical, yet lonely characters, each of whom have their own reasons for their secluded state of mind. The woman who wanted to marry Pavarotti, the baker’s son in a small Portuguese village who plays the horn when he is sad, the beautiful young couple who don’t belong together, these are just a few of Rhodes’ stunning creations. However, I have a confession to make. I had to stop reading. Fantastical as this universe was, the central character unnerved me so much I had to put the book on hiatus. Here is the description of him from the blurb: “Caretaker by day, by night he enjoy the sound of silence, broken only by the occasional crunch of a spider between his teeth”. This, along with the delightfully spider-embellished deep purple cover, should have warned me. The guard of a suicide museum, Herr Schmidt is a character of so little dimension, so much morbidity, that I actually could not face finishing the book at the time of reading. I put my copy on my “to-read shelf”, anticipating my hunger for the gothic resurfacing at some later point. And a year and a half later, as I finished my degree and had no course reading to do, it did. And I am very glad it did too. I hate leaving books unfinished, and this had been nagging me. Also, I wanted to finish it, it wasn’t simply for the readerly pride. And so I picked it out of my shelf, brought it on the train, and started reading. I was not disappointed. The world of slightly morbid, incredibly rich and fascinating characters I have come to expect from a Dan Rhodes novel were there, from the strikingly beautiful baby boy who causes the cooing Portuguese villagers to pause, just for a second, in their assertion that he one day be breaking hearts, because it seems too close, too true, to the seven year old German girl who falls in love with Pavarotti and spends the rest of her life searching for someone who carries even the slightest approximation to him. As the several pieces of the story gradually and elegantly weave together with the suicide museum at their centre, the characters unfold and their quirks, that I would like to call Rhodes-ian quirks, truly come out. The humour of this book lies not in any kind of slapstick or obvious joking. It is a subtle humour of absurd situations, absurd people, absurd communications, all with a veneer of reality making them relatable. If there is one objection with this book, it is that all the fascinating, intriguing and absurd characters are forced to remain peripheral to the fairly two-dimensional Herr Schmidt. The fact that he is a lonely, spider-eating old man working in a suicide museum is already creepy enough. As we a given little glimpses of his not very deep inner life, he does not, like the other characters, come to life. To me, he remains just a tad too morbid and repulsive, strangely more so than his co-conspirator Doctor Frölicher. His motives unexplained, perhaps non-existent, his empathy and emotion unawakened (or also non-existent). Though not my favourite Rhodes novel, I did relish reading Little Hands Clapping, and was thoroughly impressed with the amount of shivering and unease it inspired in its deadpan way. As Douglas Coupland stated, “totally sick and brilliant”. Can’t really put it better myself, even in about a thousand words. Published by Canongate in 2010.